Hello "From My Front Porch to Yours" friends! 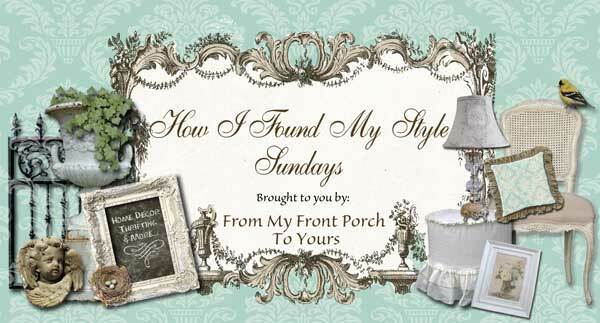 Thank you for inviting me over today, Pamela, I am thrilled to be here for your "How I found My Style Sunday" series. My "Decorating Style" developed over years and years of trial and error. My decorating style is all over the spectrum. 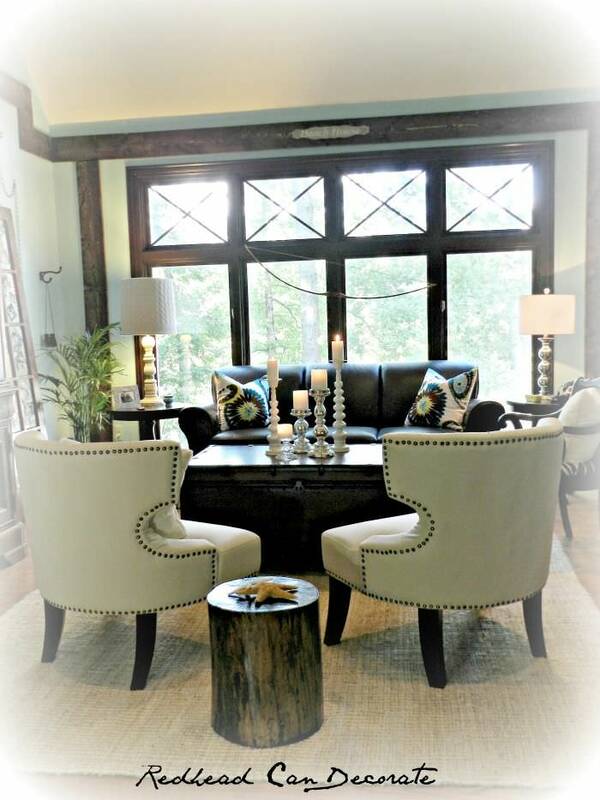 From eclectic, to contemporary, back to traditional, with a splash of country. I love it all, and I'm not afraid to mix it up. 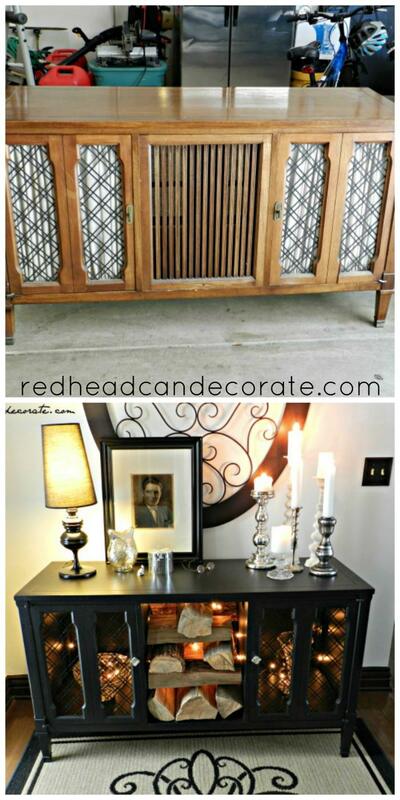 You'll also usually find a lot of wood, glass, and the color black in all of my makeovers. Those things combined create a "rustic-romantic charm" like no other. 1. Budget-I truly believe you can have a beautiful, cozy home with out spending a lot of cash. My husband and I painted the cabinets ourselves. We also used wood from Home Depot to add charm to the windows, island, and ceiling. The light fixtures were on sale, and the knobs are sanded down to copper by yours truly. 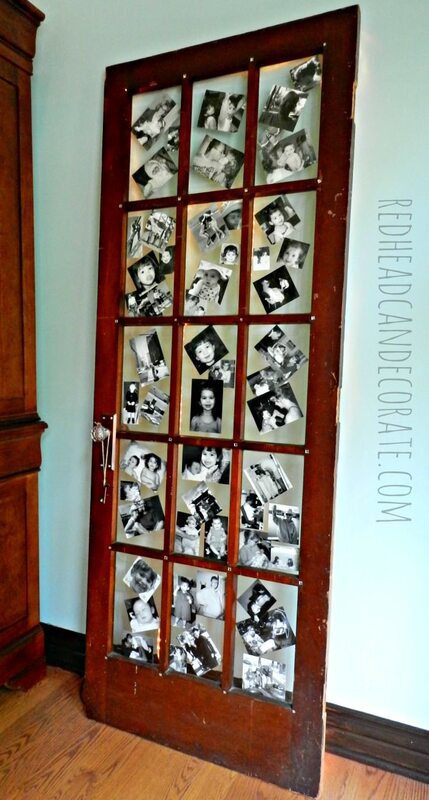 Here's another example of an inexpensive idea. Our neighbor gave us this old stereo console for free! 2. Close to My Heart- when decorating, I use items that have meaning behind them. One of the easiest things to use for that is old photos. We had this French door in the basement. I added copies of favorite photos of my family and lit it up in the back with rope lights. That's my parents on there. 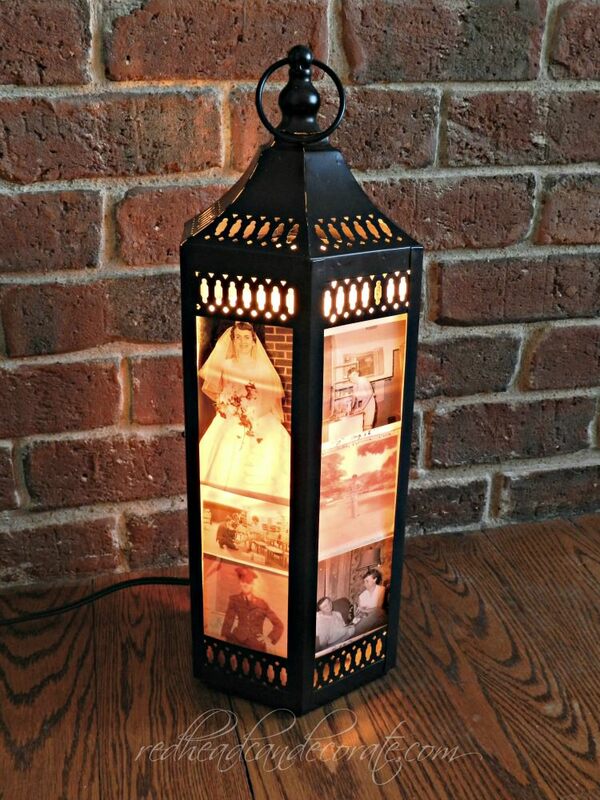 All this took was a couple photos and a small lamp to put in the lantern. 3. Never Follow the Crowd and Never Make it Look Like a Hotel-your home is your haven. It should be unique to you. Don't worry about what the neighbors or top designers are doing. Go with your gut instead. I decided to follow mine for our "Living Room Makeover" and I'm so happy I did. We added wood to frame around our windows. It was a risk, but no one else has it, and it gave the room that rustic vibe I was searching for. We decided to put the bed in front of the bay window because we needed the room. It really opened up the space and there is still plenty of light and windows. My husband and I have created a home that isn't too foo foo, but holds lots of charm and coziness. I hope some of my ideas will inspire you in your home decorating. Finding your own personal style starts with an inspiration, and then you can take it as far as your heart will let you. Julie I always enjoy seeing what project you are working on next. Your kitchen makeover is one that I just absolutely love. It looks amazing! Thank you so much for stopping by today and sharing with us. I enjoyed seeing Julie's decorating style. That kitchen is a knock out! Oh I love her blog and her style, so fun. Thank you so much, Marty! I love Julie's house partly because it doesn't look exactly the same as everyone elses! Such talent. Great choice Pamela. Julie's home is gorgeous. Love your charming decor style. Beautiful. Thank you, Kris! I appreciate your kindness!! 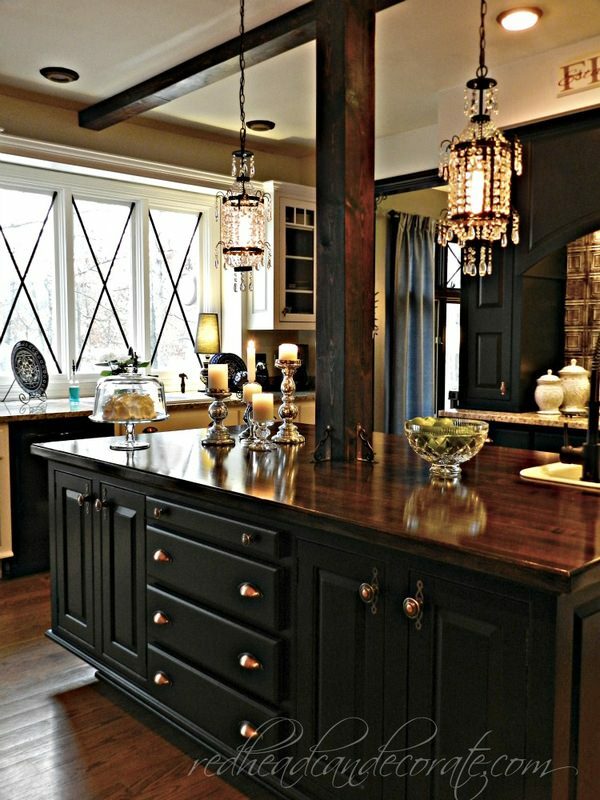 I am coveting that kitchen! It is stunning and Julie and her hubby did a fantastic job. Loved reading this...I follow Julie and she is a delight and so extremely talented...I had my bed in our bay window for many years and yes, it did open up the space...I love every inch of her home...great feature Pamela!!! I have been following her for awhile and LOVE her style and DIT's. She is amazing and I agree with her philosophy: go with what YOU like!!! I made that mistake in my early years, trying to copy others. Now my huse says "me"!! Thanks for featuring her, this was delighful to see it all again. Going to try that lantern! Julie is amazing - I remember when she did her windows with that diamond pattern and fell instantly in love with her style!! !